Which Marketer would not want to rev up Pardot’s marketing automation tool to get the biggest bang for their buck? With hundreds of applications working seamlessly with Pardot, luck is on your side! So, let us capitalize on it! As an ardent digital marketer, you may be using many apps – for designing a good looking email template, to SPAM check, or to monitor email delivery rates, etc.,- to boost your ROI and market share. The list of tools you use – often referred to as a marketing stack – probably covers a variety of different uses and needs – everything from social media marketing to content to email and lots more. But, in a world where new tools emerge faster than an eye can blink, a savvy marketer – yes, count yourself! – is always on a lookout for something better! 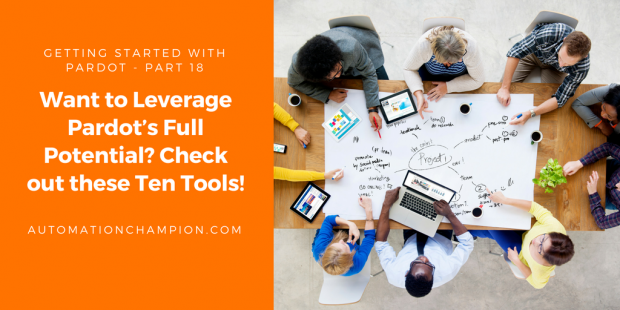 Hence, here we go with our countdown of ten productivity-enhancing tools for Pardot! 1. Add To Calendar Button:- Ah! this one is for maintaining sanity on hectic day(s) A rhetorical ask – Have you ever registered for a webinar and then totally forgot about it? Or, perhaps, you got an email about an upcoming workshop but, you were busy and forgot to put a reminder on your calendar about it? Yes, unfortunately, almost all of us have experienced this dreadful situation(s). As bad as this is, it is worst when, as an Email Marketer, you learn that half of the registrants – to one of your events – did not show up because the registrants forgot that they had signed up for the Event! Oouch! As an Email marketer, the last thing you want is a repeat of such an instance. So, as a savvy Marketer, you explore eventable which allows you to add a customizable ‘Add to Calendar’ button on an email or a landing page. And, Voila! In addition to mitigating your above pain point, Eventable also allows you to generate prospects, send a custom reminder – for example, ten minutes before starting a webinar a pop-up a message on your customer’s/prospect’s device. For more complex requirements use AddEvent.com. This tool allows your customers/prospects to easily add multiple events – organized by you – to their calendars by subscribing to your calendar! 3. Test the Spamminess of Your Emails:- I am using, and recommending, an excellent tool called Mail-Tester. The tool allows you to quickly check whether your Email looks spammy to other Email servers (Google, Microsoft Exchange, etc.). You can check up to twenty messages a day for free. Among many other factors, the tool will also show you the server IP from which your Email has been sent. 4. Collect Valid Email Addresses:- Marketers are known for creating hard to ignore gated contents to collect prospects’ Email address in exchange for a white paper. However, it is not uncommon for prospects to enter an invalid Email address – like xyz123@gmail.com12. Such instances waste resources – your precious time and efforts – and are a drain on ROIs. Avoid aforementioned unpleasant outcomes by using a tool like BriteVerify. BriteVerify identifies and removes invalid Email addresses from web forms and databases by detecting if an Email address has a potential to hard bounce before sending Emails to prospects. The detection – and early catch – would immensely help you in improving your data quality, deliverability, and Email marketing ROI. The best part is you can easily integrate BriteVerify (click here to learn more) with your Pardot Instance. 5. Create Great Content Experience:- As a marketer, you create content for your prospects or customer for marketing purposes. You may be best in content creation but, are you ensuring that you are also delivering a great content experience? For, great content alone will not give you much traffic or reduce bounce rate! Let me repeat – great content experience plays a key part in boosting traffic. Optimize your customers and prospects content experience by using apps like Uberflip for performance on the content experience metrics. Uberflip enables Sales and Marketing teams to create personalized content experiences to engage accounts, nurture prospects, and convert leads effectively and efficiently. A memorable journey for your customers – with remarkable content experiences – will bring more customers to your business. The best part is, you can easily integrate Uberflip (click here to learn more) with your Pardot Instance. 6. RSS to Email Newsletter:- Some people prefer to get news via Email instead of checking blogs or using an RSS reader. With RSS-to-email, you can publish your content once and send it to your Pardot prospects without even thinking about it. Use tools like FeedOtter to send all your blog posts as Email campaigns to your subscribers – as and when you write and publish them or, schedule a digest of content to be sent at a regular interval. FeedOtter automates sending beautiful, responsive blog digest and RSS Emails to your Pardot prospects. You can now focus more on writing your blog posts instead of manually broadcasting it from Pardot. 7. Automate Email Reply Management:- As a B2B marketer, you may be receiving tons of Email. In fact, the average B2B marketer gets 10 to 20 Email replies for every 1,000 Emails sent. Attending to Emails gobbles massive amount of time when you are Emailing thousands of people. Enable 2-way Email Engagement (send OOO email to right sales rep) and much more! 8. Create Amazing Graphic Design:- Whether you are looking to create an ebook, infographic, business card, or Email header, Canva has a template to simplify your process. In fact, the free web design tool offers professional, easy-to-customize, templates for just about any design needs you can think of! 9. Capture Prospects by Scanning Business Cards:- iCapture is the simplest way to capture the right lead information from Events or Trade shows without dealing with multiple spreadsheets and missing data. With iCapture to Pardot integration, you can create new Prospects by scanning business cards. It is also possible to assign prospects to a specific Campaign or specific lists. The best part is it can work offline – i.e., no internet required to capture these data! 10. Integrating Pardot with WordPress:- Last but not least, the good old WordPress!! Wordpress is one of the most widely distributed and powerful free content management systems and blogging platforms available today. You are using Pardot to manage marketing automation and have built your website on the WordPress platform. Fine. So now, let us find out how to bring the best out of both these platforms! In other words, you are creating dynamic content and forms in Pardot that you would want to implement on your WordPress site without the hassle of dealing with lots of code or logging into multiple sites at once. To achieve this objective, use WordPress Plugin to integrate Pardot and WordPress. Simple! The plugin is easy to install and it not only makes it possible to (1) drop your dynamic content and forms from Pardot right into your pages, posts, and sidebars, automatically; but, (2) it also adds appropriate campaign tracking codes. And, last but not least, you can use a single login to your WordPress site to securely connect with both accounts! Oh, so you too have some tools that are your favorite? Well, then, join the ‘sharing bandwagon’ and bring them on!! ← Top 5 Lightning Component Gems of Salesforce Summer’18 Release!